IT managers, burdened with managing an increasing number of devices and capabilities, are looking for ways to streamline network and data center processes while maintaining operational integrity. 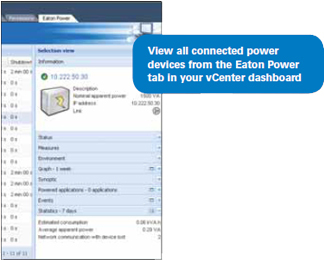 Eaton’s Intelligent Power® Manager softare brings managing a wide range of power and environmental devices under control through a single, Webbased interface. 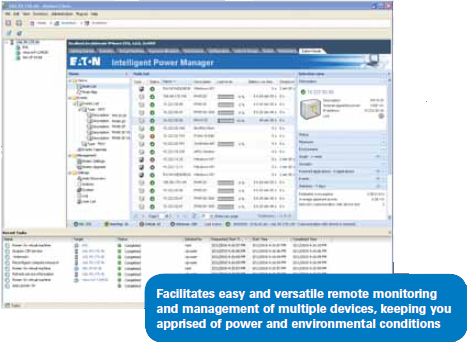 This versatile software solution is compatible with network-enabled devices, including Eaton UPSs, nonEaton UPSxs, environmental sensors and ePDUs. Because no network or data center is identical, Intelligent Power Manager has the flexibility to sort units using customized views, centralized alarms and event logs. As a result you can define an up-to-the-minute, global view of the state of power and environmental conditions across your enterprise that is accessible from any Web browser on a network computer. 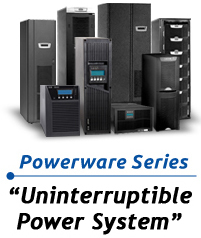 Intelligent Power Manager software. Saving time, streamlining operations and ensuring uptime — all through a single interface. Integration with vCenter helps data center managers reduce infrastructure and operating costs while increasing productivity and operational responsiveness. vCenter’s vMotion application transparently moves virtual machines from a server affected by a power interruption to an available server on the network, ensuring data integrity and zero downtime.